Investing in good On Page SEO is one of the easiest and most profitable things you can do to get permanent, regular traffic viewing your content. Therefore, learning to master it should be a priority for everyone seeking to rank any content on the Internet. The truth is that there are plenty of excellent posts explaining exactly what On Page SEO is, with all the details of how to use keywords, tools, tricks, and so on. But a common weakness I found in almost all of them is the absence of a real example, thoroughly explained from start to finish. And this is precisely where I see people struggle in real life with their pages. 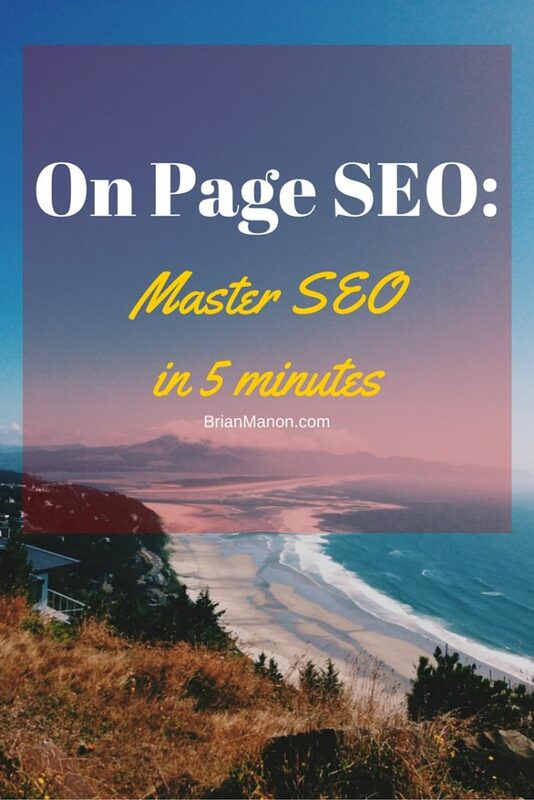 So in this post, more valuable than a thousand details, tricks and tools, I’m going to focus on making a complete example of On Page SEO. I do this myself for this blog when I try to increase my rank using specific content and certain keywords. What exactly is On Page SEO ? On Page SEO tries to explain to Google as best as possible, “what is your content.” For Google this means it’s looking at what the subject is, what the searches are, and what people are searching for in order to find your post. As you will see in this post, there are strategic points on a web page that Google is set to read and understand. Google looks for what the theme of a page is and what searches are a match to that page. If we are going to talk about On Page SEO, we also have to talk about the other side of the coin, the Off Page SEO. As the name says, Off Page SEO is about optimizing external factors to the page. The most important factor here, by far, are the inbound links (the links you get to your page), but it’s also affected by other things such as, for example, social media links (although there is some debate about whether they actually influence anything or not ). In any case, remember that the Off Page SEO is all the things you can not control on your page (at least not 100%). Hence the name “Off Page SEO” (off of the page). Also remember that On Page SEO is just one of the tasks required to have high ranking on Google. You also need some incoming links. That, in principle, is largely out of your hands. Luckily, there are techniques and tricks that you can use to be proactive without needing to wait for them to come in (what is known as link building). In the post we will step into the shoes of Maria, a new fashion blogger. After doing keywords research with a good tool like SEMRush, she decided to include keywords such as “cheap, shoes, party” within her content. It is a relatively big market for a new blog like Maria’s and that is why she will use the long tail approach. A search for “party shoes” brings up (12,100 searches / month), but using the longtail approach you can break it down into smaller searches which will be easier to rank. Keep in mind that in keyword analysis “comfortable shoes” is not the same as “walking shoes”. Tools and different accented versions of a phrase will always have far fewer searches and gives a distorted view of the actual size of the audience. From here, we will step back into Maria’s shoes and try to do good On Page SEO work in order to focus on “cheap party shoes.” But we want to reach as far as possible to get as many hits as possible. Cast a wide net, so to speak. As I said before, the goal of On Page SEO is to do your best to explain to Google “what is” your content. Google gives different weights to different parts of a page. According to Moz (one of the largest SEO authority site), within these different parts of a page, text on the page is the most important factor of all the On Page variables. I found this statement while I looked for references to link in this post, and I was shocked because it did not fit with my experience. While speaking to some of the best experts in SEO, we had come to the conclusion that the weight Google gives to keywords in the content has been decreasing significantly over time. For example, keyword density (how many times a word is repeated in the text), was very important even just last year, but today it no longer seems to matter much. But then when I read a post on Moz, I felt justified in my opinion. It is obvious but we tend to forget it: good content attracts links automatically. What good is a site with perfect On Page SEO optimization, but has only mediocre content that nobody will link to? Almost nothing, because links are essential to SEO. If you make quality content, links will build up steadily and will give more and more authority to your page over time. So, always remember that everything I tell you in this post is not worth anything if you don’t first commit to making excellent content. What does that mean for Maria’s post? In practice, it will be enough to repeat the keywords a few times in the text of the post. She must do so using natural sounding language, with some variation with synonyms, etc., and it will be basically enough, provided that the content is worth reading. We must add the advice of some SEO experts who recommend that the keywords be placed in the first or at least the first few paragraphs of text. It also helps to put them in bold. The second factor Moz highlights is the title of the page, <title>. To clarify: The main title of the content is an HTML <h1> tag but unlike the <h1> tag, the <title> tag is not visibly displayed to the user on the web page. In the window (tab) of your browser. In the search results of search engines (which is a good indication of the great weight they have). In the text for <title> you must have the primary keyword which you want to position yourself with and the more words the better. Here the simple presence or absence of keywords will have a significant direct effect on the positioning of content, and its effects can be easily checked. When you’re only using one keyword or phrase, it’s simple. It gets complicated when you want to take advantage of the long tail keywords and try to position several searches at a time. In the case of Maria, she got several long tail searches for which she sees herself working toward possible ranking. The question now may be how is she going to put all this in a single title? Be careful of using titles for Google that do not make sense. What good is being in the No. 1 position with a title so wierd that no one wants to click on it? So, let’s focus: Maria wanted to do a post on where to buy shoes for parties at a good price. It was clear that the search for “cheap party shoes” was the one that had the most interest. Therefore, it is clear that the title must have those keywords. So from here we can think about possible titles and if we can sneak some keywords in without sounding like the title was forced it will be much better. Where to buy the best cheap party shoes. Guide: The best stores in Florida and Miami to buy cheap party shoes. Guide: Cheap party shoes in Florida and Miami. Where to buy cheap party shoes in Florida and Miami. 10 wonderful shops to buy cheap party shoes. Guide: 10 stores to buy very cheap party shoes. Where to buy good, comfortable, cheap party shoes. After evaluating options, the title Maria likes is the third, “Guide: Cheap party shoes in Florida and Miami.” It contains the words that are of primary interest to Maria. It uses the long tail keywords with the words “Florida” and “Miami” and, most importantly is reasonably short. If the title had been, for example, “Guide: The best stores in Florida and Miami to buy cheap party shoes”, it would have been too long of a sentence. The length could also dilute the weight of the keywords that are of primary interest . This is an inexact science and there are no proven formulas to calculate exactly the best choice. To show you how difficult it is to predict all this, I will introduce you to another SEO positioning factor: the CRT (Click Through Rate, the rate of clicks received). It is a factor closely related to copywriting, since a title with good copy will receive many more clicks than an average title. Google is not only looking for keywords in a page. Google also evaluates user behavior within a page. If Google sees that users make more clicks on a title that appears below a search result than the one that is above it, this tends to rise your rank in the results result. In that sense,”10 wonderful shops to buy cheap party shoes ” may have been the most successful. It sacrifices the keywords Florida and Miami (although it kept “shops” and “buy”), but I suspect that it could reach more clicks because it would appeal to more people. The words “Florida” and “Miami” can be a powerful additional incentive for people living in the Florida or Miami to click on the link, and this factor may offset everything. Let’s assume I’m right with the title “10 Wonderful Shops …”. What impact would receive more clicks? First, a direct increase in traffic to the blog by the highest click rate. Improve its positioning in Google because the CTR is an important factor that Google takes into account, which would be stronger to compete in their searches. Think about it. If the second result of “party shoes” gets more clicks than the first, doesn’t it make sense that Google should move it up to the first result? The users are clearly indicating their preference. That’s the idea. As you can see, the issue of titles has a lot variation so I can not give you a 100% clear guidelines because it simply do not exist. In this case you have to use common sense and judgment with the results achieved in the past. Experiment with what works and what does not and you will see real results. Since WordPress is the most used, and it’s what I use on this blog, we will talk specifically about how titles work in WordPress. By default, the title of a WordPress post or page often determines both the title page <title> and the main content title <h1>. In WordPress.com this is basic and no frills. But in WordPress.org , one of its great advantages is that when using a good SEO plugin like Yoast SEO, you can differentiate and have different titles for everything, which allows you to dig deeper with the On Page SEO (You would need this same plugin enabled on WordPress.com for this and unfortunately it is not possible). For example, if your ranking strategy is not going to focus so much on a single search, but several long tail searches, you can use this to create different variants with different keywords in <title> and <h1>. Google only shows a limited number of characters in the titles of search results, and this is bad for the CTR. Therefore, to differentiate, use a short title for <title> and a longer one for <h1> (since the <h1> tag is going to be entirely visible to the user in the post). As you see the <h1> tag (which is what you see when you click the post) is a little long, but has allowed her to enter the words “Florida” and “Miami” which appear in different long tail searches, apart from repeating and strengthen the exact phrase “cheap party shoes”. I will not discuss on this topic because it is very simple. The best strategy is usually a structure like this blog: [domain] / [keywords], with the keywords separated by hyphens. It’s hard to say, it depends on what you want to achieve. In general, if the optimization is very focused on the keywords of a search, it makes sense that a URL can simply list those keywords. However, if your optimization seeks to use the long tail, trying to scrape as many traffic searches relatively easily to your site, then it will be more beneficial to use a slightly longer URL that combines the different words that appear on all those searches. Maria prefers the last URL, which is fairly long, it will show up in searches in a niche with a long tail, so it’s very usable. Therefore she is going to leverage every single aspect that she can, and the URL is one of them. Google also pays special attention to the words in the subtitles of a website, example: text wrapped in HTML <h2> tags to <h6> (there are 6 levels of nesting titles in HTML). It is important to have a clear Level 2 title (<h2>) that has less weight than the page title (<title>) or the main content title (<h1>). The weight of the <h3 > one is fairly minimal. So for an efficient On Page SEO, you have to think of how to use them and not to waste them on content which will not have enough strength. Reinforce the main goal. In Maria’s case, have one or more subtitles with the words “cheap party shoes”. Harness the subtitles for the long tail. These should reinforce the text content and the long tail phrases you’re aiming at should also be repeated a few times. For Maria, as in the case of the URL, it makes sense to make the subtitles match the long tail keywords. The truth is that her target search has a long tail so huge that it is very easy to put into On Page SEO; you won’t always find it that easy. With this we have titles that fit perfectly with the post and which we capture the potential long tail keyword “party shoes”. You can also use this idea in many other areas, for example, colors “red party shoes,” “black party shoes”, etc. Another important issue to bring up is after you have published your post, if it does not get as high of a search ranking as you thought, for lack of authority, links, or whatever, you should create separate posts for each of the different cities. In short, playing with all these possibilities, there are a thousand ways to scrape some traffic using the long tail. The meta-description is a special part of a website that, like the <title>, is not directly visible on the page. The most important use of the meta-description is that Google uses it to extract the text displayed below the title for the search result. Among professional SEOs, there is some discussion about the importance of placing the keywords in the meta-description, but in any case it does not matter because what is clear is that it doesn’t have much relevance. Using WordPress.com, the SEO process simply extracts keywords from the beginning of the post, nothing more. But with WordPress.org using plugins such as Yoast or third-party products like Genesis, you have the option of describing your keywords explicitly, which is obviously the best option. Meta-description: “If you want brand new party shoes often while spending very little money, do not miss these 10 wonderful shops I’ve seen in Florida and Miami”. In the end it is not to complicated, right? With what we’ve seen so far, I’d say we’ve covered at least 80% of what you need to know to put On Page SEO in practice. We will complete this post with a few more details that is necessary to know. Each post should have at least one images – don’t just use text-based content picture makes it much more easier to read (breaks the long text into sections), and you can also leverage images for SEO. Google also analyzes the images when ranking your content and when well optimized, you can also get additional traffic from searches of images. It’s good not to use your keywords excessively. Avoid using the same phrase 50 times in a text of 1000 words. For example, don’t say the phrase “cheap party shoes” over and over again. External links give credibility to your content, but internal links work in the same way. Therefore, a structure of well thought out internal links have a clear effect on the ranking of your content. It’s an effective way to keep the reader spending more time on your site, which is also very positive for the ranking of your site, and it offers the reader more related content. I personally like to automate this with the plugin SEO Smart Links this plugin lets you create a list of keywords which are automatically linked to the posts that you select (it also lets you link to external sites). You can also set rules that prevent excessive links (to limit the number of times that the same word is linked on the page, etc.). choose carefully when linking to other sites, . The content should be good quality, it should also be ranking high in Google. On Page SEO must be treated as a requirement for any blogger. It is one of the most effective ways to get permanent traffic and unlike many other techniques, it works passively (without having to be active on your site every day). If you do it right, you spend a few hours of work at the beginning and you get traffic from it for years to come. Beware that when it comes to certain niche topics you’ll have to assume that you may end up with content for which it will be practically impossible for you to rank with just On Page SEO. This can happen very often depending on the keywords you are trying to rank for. There are still many keyowords with very good SEO opportunities that you can leverage in your favor. In any case, even if nothing happens, remember you’re writing for your readers and not for Google. If you believe your content is of value to your audience, but after an analysis of keywords you see it’s not very “rankable,” you should not discard it. Ultimately, the important thing is that this post has helped you learn how to identify when your content has a good potential SEO ranking and help you leverage those opportunities. Excellent. Just really good. In fact, I have to pin it for future reference. Thank you for explaining so clearly. You should provide one more piece of information- how to get the h1 and title tags when you are producing your blog.. I had no idea what the h1 was in my blog! Going in to make some edits now! Great tips! I’m saving this to reference later. Thanks! Useful article. This should always be at hand! Such a great, in depth article. Thanks! This is a very thorough and complete article. Lots of useful information to remember when writing my blogs! I’ve been doing a ton of research on SEO so this definitely helps! This is awesome information! Especially for those that are just starting out. I love your examples and how detailed your post is! will definitely be sharing with my collegues. I am just so confused when it comes to SEO and H1 tags and on and on..I just thought you wrote and people would come…def keeping this…it is so hard and hope this helps me…. Definitely pinning this for later! SEO is one of my biggest struggles and this looks like a great indepth article! SEO is something I definitely need to work on. Have bookmarked this so I can review in depth later. Thx. I need to work more on SEO. Especially keywords. The hardest thing for me is to work them into the blog post without it harming the flow and feel of my post. Thanks for your tips! I am am going to have to save this! I need to get better at SEO. I am going to use your tips. Brian this is the best and most helpful blog post I’ve read all month. This is an excellent SEO guide that I hope others will find too. So I just pinned it to Pinterest. Thank you so much for sharing this valuable information. Have a great weekend! I’ve just gotten back into blogging after a 7 year hiatus. I have a ton of catching up to do on all the things that have changed. SEO is definitely one of the things I need to work on. Your guide is very thorough but understandable. Pinned to use as a reference guide. I just found your biog for the first time and I am so excited to bookmark this page so I can sit down and read it later!! Thanks for sharing! A very useful and helpful post. Bookmarking this for future reference. Thanks for this comprehensive expalnation. I’ll compare it to what is happening on my posts. Very informative and helpful.Thank you! Love this article. I’ll save it for future use Thank you for sharing. Super detailed post about SEO. Great post, I’ve been attempting to gather more traffic. You have a ton of gems in this post. I can see myself coming back to review this again. Thanks for the wealth of information. Nice post Brian! I am not really good with SEO though this post has shown me a few good things. First time I really understood SEO. Loved the example of party shoes…it helped make it clear for me. Sometimes I think I spend more time on mechanics of my blog than actually writing it. SO, I’m gonna try to re-read this, and apply it to my next post! 🙂 I think I find the titles for things that are good for SEO contradict my need for creativity, and that’s a problem. And I haven’t ever implemented subheadings yet. I’ve heard that google/search engines like updated content, so maybe I’ll go back and add in some subheadings to older content too. Posts on SEO are always so helpful for me! I’ve learned a lot on this post. Thanks! Very useful article. Love readings post on SEO. I’m on blogger thou. Thanks for the tips! I need to get it together when it comes to SEO.. I pinned this to go back to later:) Thanks for sharing! SEO and I are not friends. Thanks for breaking this down! Thanks for laying it out in simple terms for me to understand. I’ve pinned it to refer to often! SEO is just so over my head and confusing! This made it that much easier….now to implement. I still struggle with SEO. Thanks fort he great tips! This guide is so complete, more than many on line (payed) courses! Thank you for al these tips, There are things I hardly imagined, like the SEO smart link. Thank you very much! Great article! It’s going to take a while to process all the info. Keep up the great work here and live unstoppable! Plenty of valuable information! This is really helpful for newbies to learn what the heck is SEO. Wow – I thought I knew what SEO is, but I learned so much more from this article! Thank you so much, this was an awesome post. This is such great information on SEO, it’s so difficult to learn about SEO and its really hard. I definitely needed a lesson on this, thank you for the informative post! Thank you. I am still trying to figure out SEO and this helped a lot. This is so helpful. Your examples are really helpful and thanks for breaking everything down to an understandable level. I’m saving it for later. This is very helpful. Especially when using the real life example. Thanks for sharing these tips! Great resource. I needed a simple, usefuls guide to SEO and this ticked all the boxes. I really am more knowledgeable now. Thanks Brian. Really informative post,most blogs fail to rank because of poor SEO,I think most bloggers just fail to understand what SEO is all about and it`s importance in ranking posts. This is such good information! Installing Yoast was one of the best things I could have done. It has helped in a big way. Now, my chore is going over old posts and bringing them up to date. Such valuable information! Thank you! I had no idea about most of this! !